Fresh Fruit salad, Greek Yogurt, Fresh Orange Juice, Cereals, Eggs (Scrambled, poached or boiled) from our own flock of chickens, living in the meadows down by the River Swale. Dry cured bacon, mushrooms, grilled tomatoes. Bread from the local Reeth Bakery. Homemade marmalade and jams. Fresh Coffee, Leaf tea (Breakfast tea and Earl Grey) and a selection of fruit and herbal teas. The House is part of a lovely 1890's stone terrace, with three pubs, two hotels and a caf�/restaurant in the village nearby for your evening meal. 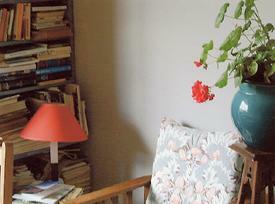 Your room has cotton sheets, fresh flowers and piles of interesting books. Guests Bathroom on the same floor with oceans of hot water and Radox for weary limbs! There is also a downstairs shower. Large sitting room downstairs where you can relax with a pot of fresh coffee or tea and browse the bookcases. Packed Lunches �4. Sandwiches made using bread from the Reeth Bakery with a variety of fillings; ham; Wensleydale cheese; cream cheese; tuna etc. all with salad. Choose some fruit, a carton of fruit juice and some flapjack. Sandwiches only �2. Clothes washed and dried (when possible) �5 per load. 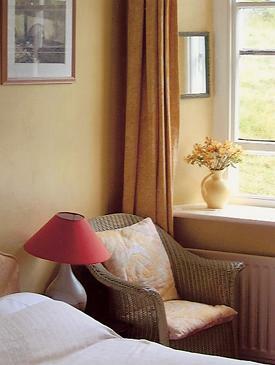 Come to Reeth and take advantage of our private fishing on the River Swale. Jenny Davies makes patchwork and her work is for sale at 'The Garden House' in Reeth - www.gardenhousepottery.co.uk. 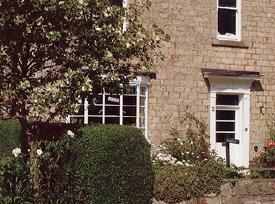 Bed & Breakfast from �20.00.